Earlier this week, I found myself at Target, shopping for a Snot Sucker, which seemed somehow an appropriate way to commemorate the first anniversary of an executive order banning certain immigrants from our country. In fact, it was because, in part, of that executive order, and the animus it seemed to ignite in our country, that I was buying the device in the first place. This week marked not only the anniversary of the first so-called “Muslim ban,” it was also the anniversary of the day a young man named Abdulrahman, his wife Samiha and their little daughter came to America. They arrived the day before the ban, from Jordan, where they’d been refugees for three years before fleeing Syria. They were welcomed by Exodus World Service, and also, by my friend Jane and I. Because of the inflammatory rhetoric regarding refugees, and what I can only describe as a call from God, I had asked Jane (who’d volunteered with Exodus for decades) to help me learn more about refugees and how to help them. 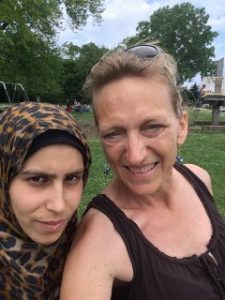 As our country engaged in fear filled debates, I determined to not only educate myself about the refugee crisis, but to actually meet some Muslim refugees and get to know them. A year ago, I went with Jane to the tiny motel room where Abdulrahman and Samiha were staying temporarily, bringing them supplies to set up house. This young couple, about the same age as my own children, was bewildered yet grateful when we showed up with pots, pans, towels, dishes and more. Samiha was quite pregnant, and their daughter was only about 18 months old. That day, I asked, via a translator, could I visit them again when they got their apartment. Yes, they replied. Through Exodus, I signed up for the “new neighbor” program, which asked me to visit weekly for three months. At the end of those three months, Exodus sent me a letter thanking me for participating, and that my obligation had been fulfilled. I told them that I was in too deep, there was no way I was stopping my visits. This family welcomes me each week. Today, these dear ones are my friends, my adopted children and grandchildren. 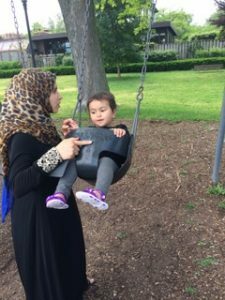 This Muslim family calls me “Mama Keri,” but in Arabic the “r” is hard to say, so it sounds like “Mama Ka-dee.” When I missed a few visits due to holidays and travel, Samiha eagerly told me that the toddler had asked where I was. Because of their culture, Samiha does not leave the apartment alone. The family will make a trip together to buy groceries and supplies, but money from Abdulrahman’s job at McDonald’s is tight. She doesn’t drive, so making a Target run, something I take for granted, is something she simply can’t do. Their son, born here, is fighting a cold this week. Which is why I am at Target buying a Snot Sucker and diapers. Because that’s what a mama does. When I visited last weekend, the baby was fussy. “No sleep,” she told me wearily. Samiha nursed him, then set him on the floor. Completely unselfconscious, she said, “Keri, look,” and showed me the ravages of what a baby with stuffy nose can do to a nursing mom. She had no lotion or cream, so I suggested olive oil to soothe the bite marks. Using the toddler’s toy baby doll, I pantomimed nursing it, then gently pulling it off when and if biting occurred. She was looking for sympathy, advice, help, and I tried my best to give it. I promised to shop for a bulb syringe and saline drops. In other words, I mothered her. 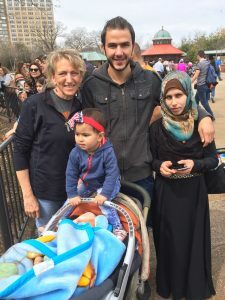 I have written about this family before (read it here), and how they offer me hospitality with meals and kindness, as I offer them hospitality by simply showing up, letting them know that despite the rhetoric they may hear on the news, they are welcome here. I am aware of the precious gift of her trust. I’ve earned it through months of simply showing up, of listening, giving my time. And yet, that trust is a gift. I welcome them to America, and they welcome me into their lives. In offering hospitality, I experience the amazing hospitality God has offered to me. God welcomes me into relationship, into community. And in offering mothering to this young woman, I became more aware of the mothering of God. The Bible is full of countless analogies of God as a mother—whether it is powerfully birthing a world or a nation, protecting, nurturing, or tenderly loving. Read, for example, Isaiah 66, which uses extended imagery of birthing and nursing to describe God. During our visit, we also worked our way through reading Hop on Pop, the Dr. Seuss classic. I’d expected to read it to the toddler, but she was more interested in actually hopping around the room than listening to book about hopping. The book was actually helpful to Samiha, who is trying to learn English. I’d read a page, then use Google translate to help her understand. She tried to point to and say the letters. She looked puzzled at lines like “Three fish in a tree? How can that be?” I tried to explain Dr. Seuss humor using Google Translate, which was just about impossible. I showed her how words that rhyme end in the same letters. As we discussed nursing her baby, and read a children’s book, I asked a question: did she ever get to talk to her mother on the phone? I knew her family was still in Syria. She shook her head, and said, “No. Syria.” Meaning: because they were in Syria, she could not call them. Via Google Translate, I asked if she could email or even write letters. No, she said. People sometimes ask how I can communicate with someone who hardly speaks English, who is literally learning things like how to say her colors in English. But in that moment, she looked at me sad. I looked at her sympathetic. “I’m sorry,” I said. She quickly hugged me. And I resolved to do the things a mom would do—like pick up some supplies from Target to help her weather this round of colds. To reassure, with my presence, that she is not alone. In that moment, and countless others like it over the past year, I have felt as if Jesus were right there with us. Jesus said that when we offer food, drink, respite, shelter, clothing to those in need, it’s as if we are offering it to him. It’s interesting that Jesus names things that are often associated with mothering: feeding, clothing, sheltering, visiting. And when we mother others (our own children, or those in need of a mother), we experience the mothering of God in a new and profound way. Driving home, I was almost in tears. I thought of my own daughter, who lives far from me but is never more than a text away. Despite the distance, we talk every week. I saw my daughter this month, and will see her again in March. I realized how lucky I am, and I realized how desperately lonely most refugees are. I thought of Samiha’s mother, half a world away, unable to even talk to her daughter. I grieved for her. Samiha’s situation is not unusual. Refugees leave everything, because they cannot go home. And I resolved to continue to mother this family, because of the way God has mothered me, and because Jesus asked me to do so. You cannot give away what you do not have. I’m thankful to have a mom who loved and nurtured me. I’m thankful to have learned how to be a mom by raising two kids. And I’m thankful for the mothering of God, the tender nurture of my soul that equips me to offer the same to a young woman. Who is God inviting you to “mother” so that you can more deeply experience the mothering of God? Love this! Thank you for reminding us and for showing God’s love to these people. So humbling and beautiful. Thank you for sharing your heart, Keri. I find mothering my 3 grandchildren is a beautiful time in my life. Loved your story. Well written and I hope you continue with your kindness and love for these neighbors. Help them learn English in order to get more adjusted to their new life in America. That is one thing I think should be offered in places where ALL immigrants can go for free information and learning how to get adjusted to a new land. Language is a barrier we have to face when we enter another country. I know going overseas it is hard to get to know the locals who don’t speak English while airports and places provide help, the local people are hindered to get to know the purpose and will of others. You are a missionary of sorts in your own community! Thanks Linda. We do work on English. While language classes are available to refugees, this young mom, with a toddler and infant at home, and a cultural barrier that kept her from going out alone, found it difficult to get to classes. Thankfully, I and one other couple visit her, to work on English with her–and to simply being a friend. Thanks Sibyl… you’ve always been a role model for me when it comes to hospitality, and a person who mothered me spiritually. Thank you! Keri, I realized years ago on a visit to India that anyone anywhere can be my family or my friend. Thank you for showing the love God has for us all. Reading GodSpace? Get your FREE study guide here. Join my mailing list to receive the latest posts from the blog sent to your email box.